Banners are a versatile method of advertising, but a lot of them are installed incorrectly. 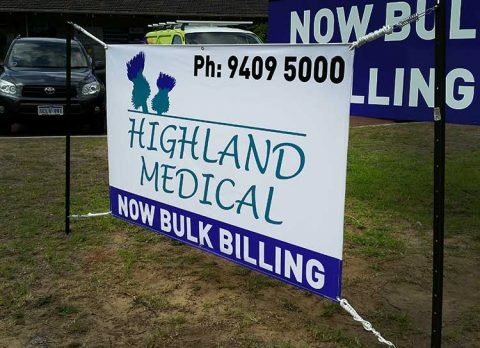 Find out how to do it correctly by getting Perth Graphics Centre to install your banners. Simply putting star pickets into the ground isn’t enough. Banners act like a sail and catch a lot of wind, so ensuring they don’t tear is critical. After all, a business doesn’t look all that professional when there’s a torn piece of canvas flapping around in front of a shop. Have a look in the corners of the banner shown here and you’ll notice that it isn’t just rope attached to the star pickets – there are springs as well. The springs attach to the star pickets using D-shackles. The banner is strung up by feeding the rope through the spring, then back through the corner eyelets and pulled tight. They are then tied off. What this does is allows the banner a certain amount of movement. The banner has some give in it so that when the wind picks up, the banner moves and lets the air past. This prevents the banner from tearing and gives your banner a far greater outdoor life. 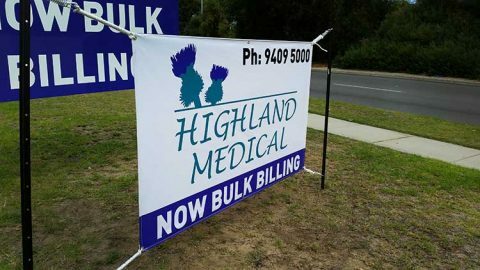 If you want a banner installed properly, then call the experts at Perth Graphics Centre. You can be sure it’s always done properly.